Wishing all our readers across the globe a very very Happy and Colorful holi. 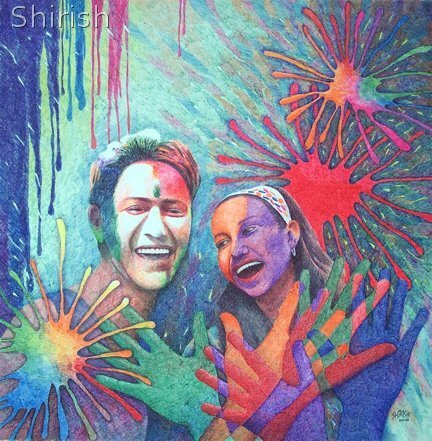 Ball Point painting by Shirish Deshpande of Belgaum on account of Holi. In Belgaum from the past years the main attraction has been the Holi Milan program organized by MLA Abhay Patil on Subhash Chandra Bose Ground (Lele ground). Even this year Holi Milan program has been organized from 9 am. Another unique celebration which is unique to Belgaum is the Lotangan infront of Ashwathama temple in Pangul Galli. There is an annual fest on the second day after Holi. All devotes do a “Lotangan” and water is thrown on the devotees from all the houses. In Pangul galli, a large number devotees performed “Lotangan puja” (“urulu seve”) at Ashwathama temple to pay their respects to the epic character of the ‘Mahabharata’ on the occasion. . The temple, that houses the idol of the cursed mythical warrior, and is located in a narrow Pangul galli off Ganpat galli in the heart of the city, is believed to be the second in India. However, not many visit this shrine during rest of the year thanks to the curse attached to Ashwathama, who was believed to have killed the sons of the Pandavas. It is believed that seeing the idol brings bad luck. Again Happy Holi and play a safe holi with natural colors.